Orange Amps began with founder Cliff Cooper back in 1968 in London. The fast-growing company outsold Marshall in 1972 and started a very impressive client list of Fleetwood Mac, John Mayall, Jimmy Page, BB King, Ike and Tina Turner, Stevie Wonder, and James Brown. 43 years has built a strong foundation for this company and its latest design isn't even orange! Menacingly small, easily recognizable, this aggressive little amp comes with a mind-blowing sound, which combines the Shape control of the Thunder series with the weight and size of the monster Terror family. This Frankenstein-like amp has crazy amounts of gain on tap with disturbingly pleasurable responsiveness. It is uncompromisingly brutal, doubtless unhinged, even ferocious! The Dark Terror is based on the original Tiny Terror Head that is often dubbed, "The Lunch Box" due to its small size and handle. The original sold over 30,000 units! Central to Cliff's amp design ideas was the maxim once popularized by guitar design legend Les Paul: Les has always maintained that people hear with their eyes -- in other words, styling is crucial. Brilliant orange-colored vynide covering; robust picture-frame amp sleeves and cabs; and the 1950s retro sci-fi amplifier controls, together marked out Orange as totally unique. 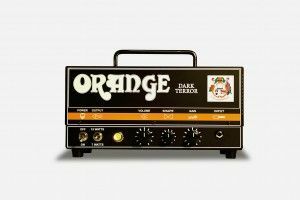 To hear some current artists playing Orange Amps check out Coheed & Cambria, Mars Volta, Jimmy Eat World, Sugarland, Rise Against, Black Eyed Peas, Hawthorne Heights and Switchfoot to name a few. Obviously, these amps know no boundaries when it comes to different styles of music. The Dark Terror will be available in May 2011.